Yu Xiang is one of classic flavors of Sichuan cuisine. The name means fish fragrance in Chinese. But no fish at all in these dishes. The fragrance is from the combination of sauce and seasonings which are used to cook fish. It includes chili paste, ginger, scallion, garlic, soy sauce, vinegar, sugar, and salt,etc. There is a story in it. Long time ago, a family cooked fish every day. But one day there is no fish at home. The housewife saw the left sauce which was used for cooking fish. She got an good idea. It was a waste to throw away the seasoings and sauce, why not cook other foods by using them? Then she used these left seasoings and sauce to cook several other foods. When her husband came back, she was nervous to wait her husband's response. "So delicious! How did you cook them?" She was so delighted that her families like these dishes. Later, neighbors knew this cooking method and enjoyed it. And later, Yu Xiang became popular delicious cuisine. The first time I ate Yu Xiang dish was at Dalian, China. At that moment I didn't know the story. I wondered why they didn't have fish in it but called "fish fragrance dish". But the food was delicious, a little spicy while just right. There was a unique flavor that other dishes didn't have. What's that? Now I know it's "PiXian Bean Paste", or PiXian DouBanJiang, SiChuan Broad bean Chili Paste, etc. PiXian is a county in SiChuan. It makes the best SiChuan bean paste. Unlike other chili sauce, PiXian bean paste is not too hot&spicy. The bean used is local broad bean. The whole process will take three to five months. Boil the broad bean, then mix with wheat flour, and fermented about 6 to 7 days; Mix in salt, expose to the air for about 45 days till the broad bean becomes red color. Add in salt and grinded chili pepper, fermented about 3 to 5 months. The unique flavor is from the fermented broad bean. You can use this PiXian DouBanJiang whenever you want to cook SiChuan style dishes. Popular Yu Xiang recipes are Yu Xiang Pork Thread (Yu Xiang Rou Si), Yu Xiang Eggplant Strips (Yu Xiang Qie Si), Yu Xiang Beef Thread, Yu Xiang Chicken Thread (Yu Xiang Ji Si). I read an article written by an American guy. He said he ate a very delicious food called Yu Xiang Beef when he lived in China. He missed that dish very much after going back to the US. He searched and asked Chinese friends, at last he got the recipe and then shared it on the internet. I feel his recipe is a little complicated. In my recipe, just prepare well two seasonings, cutting well material into thread, then you can make delicious "Yu Xiang" dishes. Yes, in restaurants, the meat should be poured out after stir fried and put back again. And the chef adds sauce one by one, not all in one. But homemade dishes don't need to be so complicated. We can make it easy, simple and fast without spoil the flavor. PiXian spicy bean paste is salty. Don't add too much of it. If your material is a piece of chicken breast, one tablespoon or less is enough for a piece of chicken breast. Don't need to add any salt, only need a tablespoon soy sauce in marinade sauce. 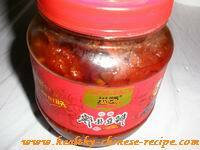 There is a secret to make Yu Xiang dishes more delicious-- add a tablespoon tomato paste.